That Dude Knows His Birds! Seemed like an appropriate intro based on yesterday’s special event. Hoping all my loyal readers in the States had a chance to witness the solar eclipse. I opted to stay in the area, so we were only able to experience a 93% reduction. Somewhat disappointing since 7% of the sun’s light is well… still pretty bright – surprisingly bright. Still something cool to experience. Some of my friends traveled further south to witness the total eclipse. That sounded intriguing until they recounted how horrendous it was to get home after that. What would normally be about a 3.5 hour trip ended up taking over 6.5 thanks to going 10-15mph on the main highway back. In light of that (see what I did there – literary genius I tell you hehehe), I spent some time thinking about today’s post topic. After some deliberation opted to go with something that had a similar “dark” theme. With that said, I bring you this colorful little bird. 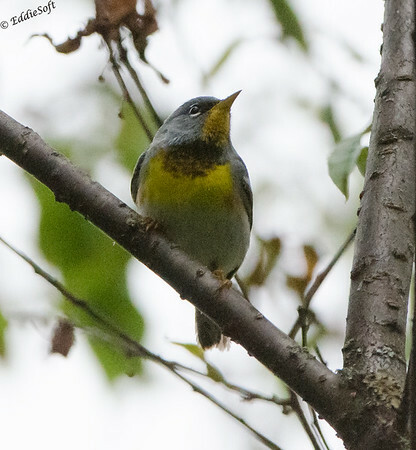 This Northern Parula was captured while Linda and I were visiting Grand Portage MN back in July. We are headed out to photograph the waterfall there. As mentioned in the fox post previously, it was starting to drizzle. As we were walking the path there, an interesting sound came from a nearby tree. By then the rain was coming down harder and the thick forest was blocking out what little light was trying to break through. There are times when you have to focus on someone other than yourself and this was one of them. Linda had recently done something very nice for my birding checklist and therefore opted to focus on the task at hand – waterfalls. Onward we went. Then a stroke of luck happened – Linda couldn’t find here phone. Hmmm maybe I can cleverly disguise a self-centered act as a chivalrous act for the one I love. “Oh no, let me run back to the RV and see if it is there… just for your dear.. wink wink”. Holy crap it worked. I think she even felt bad I had to run all the way back to the RV. Off I went with credits in the bank and an opportunity to solve a mystery. Yes, I made the first priority to get the phone. However, on the way back I kept my eyes and ears on the trail’s edge. Near the spot I originally heard the mysterious song was a young couple also looking up into a tree. Turns out they had heard the same song and was investigating the source as well. Like us, they were unable to spot it. That is when the young guy mentions that it was the song of a Northern Parula. Wow, that dude definitely knows his birds. He then stated, I always love hearing their song, but I rarely ever get to see one. A quick look at Cornell’s site confirmed they tend to hang out in the canopy. Seconds after he mentioned that, the source of the melodic chirps decided to come out for a brief visit. There I was holding big glass in dark forest conditions with a gorgeous bird on full display. No worries, made some fast adjustments and did my best to focus through the various limbs and leaves. Sometimes it goes your way, sometimes it goes horribly wrong – that day experience came through and the Northern encounter can be forever remembered. Note, the couple couldn’t believe anything came out on the image – showed them my LCD and she showed me the black silhouette she got with her camera phone. I thanked the guy out for the assist on the identification and proceeded on to meet up with Linda with a great sense of satisfaction. She got here waterfall shots, we found her phone, she loves more even more and I now have a much better picture of a Northern. Again, the great thing about bird photography is you always have the opportunity to improve on your shots. If you are curious, here were my previous inferior captures (link here). Have to go work on Halloween decorations now – hope you enjoyed reading about our brief encounter with a cute little bird. I shoot in Auto-ISO mode most of the time, which gives me total MANUAL control of the shutter speed and aperture, which I set MANUALLY, and then override of the (auto) selected ISO by MANUALLY using the exposure compensation dial, which I do MANUALLY all the time. So it’s really a MANUAL mode without having to center or off-center a needle, which can take time. 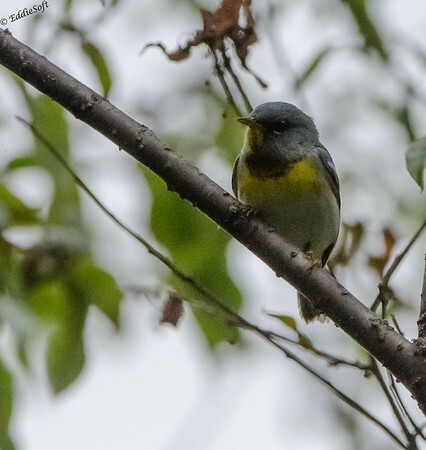 I do have shots of a Northern Parula, which is a refreshing change from most of your bird posts, and I have some in perfect sunshine as it came out of the tree foliage and sat there in plain view for me. I felt like St. Francis of Assisi, but with a camera. I like the win-win situation of helping your wife and yourself. Nice. So what you are saying is you are nearly shooting on full automatic! Well, at least that is my read on that. I’ll let Linda weigh in on this if she wants – as another full manual mode shooter… well I take that back she goes to Shutter priority on her waterfalls so looks like I am the the judge and jury on this one.